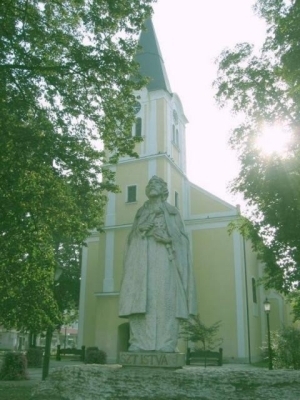 It is situated in the south-western corner of Hungary and county Zala, near the Slovenian, Croatian and Austrian border, where three regions  Őrség, Göcsej and Hetés - meet. The foundation of the settlement was first mentioned in records in the Middle Ages. Today Lenti is a small town with friendly atmoshpere, where the restaurants await visitors with gastronomic and wine specialities and local dishes. 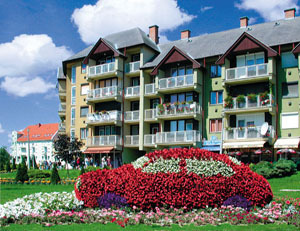 Tourism plays an important role in the life of the town. The environment, the clean air, the large areas of untouched nature all attract many visitors. The town is duly proud of its Thermal Bath and St. George Energy Park, which awaits visitors in a 4ha green territory with 5 outdoor and 3 indoor pools. 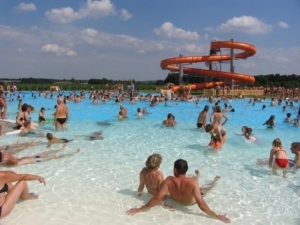 It is famous for its water throughout Europe, which is excellent for treating degenerative vertebral and articular deformations and other locomotor disorders. The effects of the medicinal water are completed by the points of the Saint George energy park. With their help guests can relax, vitalize, and cure themselves more effectively. (Táncsics u. 2/A, Tel. : (92) 351-770). A new pleasure bath was opened in July 2004 with a water surface of 1,340 m2. In the pool you can enjoy a wild current, massage benches, neck showers and a 74m long giant chute. A unique attraction of the bath is the palm garden with live palm trees offering a Mediterranean atmosphere. In spring 2005 the House of Traditions was opened presenting valuable collections of ethnography and local history from the 18 and 19th centuries. Sights: remains of the 12th century castle (one of the corner turrets, with a nice, barrel vaulted cellar) and St. Michael Church (17th century, baroque), (Dorfmeister-frescoes, baroque statue of the Holy Trinity), the House of Traditions (the collection of folk values from the 18th and 19th centuries), a forestry exhibition 'The treasures of Göcsej - the forest and the trees', the fishing lake of Sárberek, Lenti Park forest with special spring flowers -where you can admire thousands of snowdrops, spring snow-flakes, and in late spring - the crown imperials.